HomeSinas Dramis Law Firm BlogMichigan Speed Limit Increase: Will Roads Become More Dangerous? According to the Michigan Department of Transportation (MDOT), the speed limit on more than 600 miles of freeways is being boosted from 70 to 75 mph, while it going up to 65 mph on another 938 miles of state roadways. Speed limit signs started changing May 1, and the higher speed limit is official when the roads are actually signed. an 18-mile stretch of US-127 from the I-69 intersection until St. Johns. a 33-mile stretch of I-69 starting at the intersection with East Saginaw Street in Bath Township and heading east into Genesee County. Based on an MDOT map of the Michigan speed limit increase, the speed limit is not being raised on the highway around downtown Lansing or south of Lansing, including the I-496 and US-127 interchange and the I-94 and US-127 corridor in Jackson. 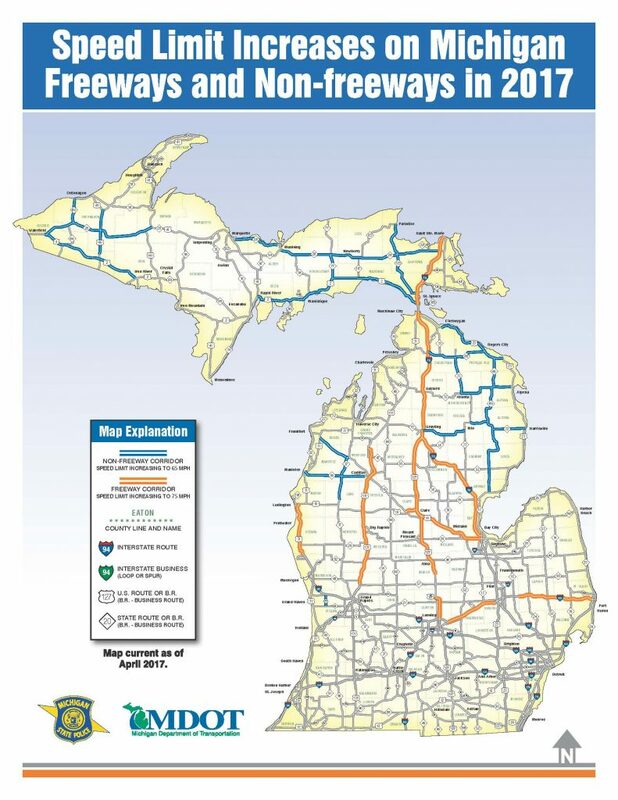 This is good news because both of these areas have been designated by the Sinas Dramis Law Firm as Michigan dangerous roads, due to the high rate of auto accidents. Why is there a Michigan speed limit increase? Because last year, the state Legislature passed a law instructing MDOT and the Michigan State Police (MSP) to consider raising the speed on freeways and highways across the state. After an analysis and review, MDOT and the MSP have decided it is now time to boost the speed limits on certain roadways. According to MDOT, the following stretches of freeway are jumping from 70 to 75 mph for most vehicles. The speed limit for large trucks, including semi-trucks, is increasing from 60 to 65 mph. As for state routes, the speed limit will increase to 65 mph in the following areas. Will The Michigan Speed Limit Increase Lead To More Crashes? most motorists are already driving at the increased speed on these roadways. It may be true that drivers have routinely been traveling at the higher speed along the selected Michigan highways. However, the question now becomes whether the Michigan speed limit increase on these roads will make them more dangerous, leading to more Michigan car accidents, serious injuries and fatalities. While we do not yet know the answer to this question, research has been conducted in recent years on speed limit increases and the impact on auto accident rates. In 2016, a speed limit increase study performed by the Insurance Institute for Highway Safety (IIHS) found that boosting maximum speed limits has led to more deadly car accidents across the United States. The IIHS study examined the effect of maximum speed limit increases in 41 states from 1993-2013, and looked specifically at traffic deaths per billion miles traveled by the type of road and the state. The study revealed that every 5 mph maximum speed limit increase caused a 4% increase in the fatality rate. On freeways and interstates — the roads that most often see speed limit increases — the study showed the fatality rate jumped 8%. By comparing states’ annual fatalities to the total expected if maximum speed limits were not raised, the IIHS study concluded there were about 33,000 fatalities during the 20-year period that could be directly attributed to speed limit increases. According to IIHS, this is probably a low estimate because the study considered only increases in the maximum speed limit, which often applies to rural interstates and many states have also increased speed limits on urban interstates. As a law firm that primarily handles Michigan no-fault claims and lawsuits involving damages for car accident injuries, Sinas Dramis is concerned about the decision to increase the speed limit on certain Michigan roadways. However, with that said, we encourage all Michigan motorists to drive safely and abide by the new speed limits. In this video, Grand Rapids auto accident attorney Tom Sinas talks about the decision to increase the speed limit on certain Michigan roads. If you or a loved one has been hurt in a car accident, you’re entitled to certain no-fault PIP benefits and may be entitled to other compensation for your injuries. Contact our Lansing auto accident lawyers and Grand Rapids car accident attorneys to discuss your case.